You can look at / read an excerpt of Horrorstör on Tor.com. Horrorstör is a beautifully designed object. This square-shaped book comes in a glossy cover, with a very IKEA-style appearance. The book has authentic catalogue inlays and introductory copywritten text content, uses catalogue-style fonts, and each chapter is named in a pseudo-Scandinavian way after a minimalist piece of furniture. It evokes the look and feel of an IKEA catalogue beautifully. I have a weakness for quirky gimmicks, so when I saw it, I had to buy it. Once it was in my hands, it did not disappoint. 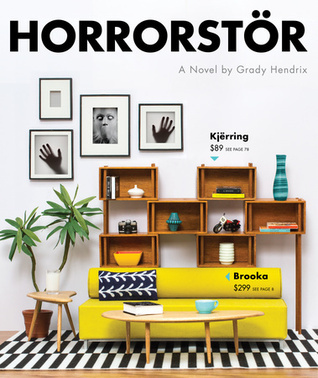 It really does ooze with IKEA-ambience, and if there are awards for book design and presentation, the publishers (and designers) of Horrorstör deserve accolades. Amy, our protagonist, is a demotivated worker bee, young, cynical and sarcastic and not trying very hard. She could just as easily be one of the slackers in a Kevin Smith movie. She's trying to avoid her manager, Basil, who is altogether a bit too earnest and a devout follower of the Orsk way (Orsk being this novel's imaginary IKEA knock-off brand). As annoyed as Amy is with Basil's sincerity and officiousness, he was instantly my favourite character. Her other colleagues are less memorable - there's the checkout lady who is ultra-nice and liked by everyone because she has no rough edges at all. There's the promiscuous girl, and a young man trying to get in her good book / pants. Everyone else might just about warrant a name, but they're soon forgotten anyway. Once the shop closes its doors, the story follows the well-trodden path of a haunted house slasher. For a while, there is a gradual build-up of ominous and sinister events, and then there's a pivotal moment, after which we're into horror territory. With a book as neatly presented as this, there is a risk that style might trump substance. Fortunately, Horrorstör's interior matches its exterior in tone. Starting out with a cheerful description of employees turning up to work (zombies, until they consume megadoses of Starbucks), the writing voice is slightly irreverent, light-hearted, not trying anything too clever but perfectly slick and inoffensive. The flair of the presentation and the tone of the story inside are in tune with each other. If it were a wine, this'd be a Gallo / Blossom Hill Zinfandel / Grenache. We're firmly in light-entertainment territory. The book has a sense of humour which fits perfectly with its exterior (or vice versa). There are plenty of wink-wink, nod-nod Easter eggs in the text, ranging from mock-Scandinavian words that sound rude in English, via real foreign words that English speakers tend to find amusing if they transliterate them (e.g. Kummerspeck), all the way to Nazi concentration camp slogans appearing in translation. It's tongue-in-cheek satire, comparable to the tone of movies like Josie and the Pussycats, or the corporate-world-mocking jibes of the TV series 30 Rock. Once our gang are locked in for the night, the novel most reminded me of the movie House on Haunted Hill. That film is a guilty pleasure for me. It's not really all that scary because the build-up is quite short, and the horror, when it starts, is quite over the top, but it has its moments. Horrorstör does more or less the same. Short build-up and rapid escalation, with a few neat observations (never again will I look at the giant, windowless, artificially lit, retail-optimised labyrinth of IKEA without a sense that it is rather cynical and sinister). The pace and rapid escalation makes it quite a 'safe' horror story - it never builds up bone-chilling terror, the way, say, The Orphanage, does. My problem is that I rather wanted it to do just that. I definitely expect more from books than I do from movies. Horrorstör may one day make a perfectly decent teen slasher movie, like aforementioned House on Haunted Hill, or the Final Destination Series, or a zombie movie. But, at book length, I hoped for something a bit more gradual and suspenseful and scary. This isn't a suspense horror story, it's a horror-themed action story. It toys with the reader's sense of humour, not with his/her adrenaline. All in all, it's a bit shallow, but readable, and beautifully presented: worth getting if you like light entertainment horror, but don't expect to be frightened.